The 75-year-old crooner sings alongside a Spanish-style guitar accompaniment in Love Will Set You Free. Engelbert will be joined on stage by guitarist James Bryan at the May contest, in a performance staged by choreographer and former Strictly Come Dancing judge Arlene Phillips. The BBC announced earlier this month that Engelbert was the surprise choice to represent the UK following years of disappointment, with boy band Blue coming 11th in 2011 and Josh Dubovie coming a humiliating last in 2010. 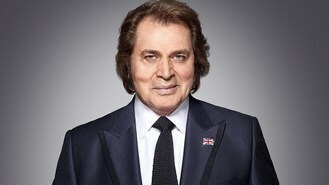 Engelbert said that he had his "eyes on the prize" with the track, which was premiered on the BBC's Eurovision website. He praised the ballad for its "quality and longevity" and called it "a beautiful romantic song". "I have been called the 'King of Romance', I've represented romance all my life and have been a part of the business for 45 years. You can't pretend, it has to be within you," he said. "Romance is what makes the world go around, when people hear romantic songs, they fall in love." He said of the contest: "Nobody knows what will happen, but I'm going to do my very best." Love Will Set You Free was recorded in London, Los Angeles and Nashville and has been written by Sacha Skarbek - who co-wrote James Blunt hit You're Beautiful and Lana Del Rey's Born To Die - and Grammy-winning producer Martin Terefe. The song, which features the chorus "If you love someone/Follow your heart/'Cause love comes once/If you're lucky enough", has already received a mixed response.